If you’re a lover of country homes, this 101 year old charmer is sure to grab your attention. The three bedroom home has benefited from recent renovations and will have you swooning; featuring wide polished timber floorboards, high ceilings, and a brand new country kitchen complete with farmhouse sink looking out over your 5.48 acres of land. The quintessential front staircase, typical of Queenslander style homes, will seize your attention upon entry to the property. The verandah envelopes the home on three sides and french doors welcome the outdoors in. The floor plan is socially inviting and the lounge room has a wood fired heater to enjoy in the upcoming winter months. Downstairs, you’ll find an entertaining space with paved floor, along with a couple of lock-up storage areas, a second loo & shower, and the laundry area, complete with the classic concrete washtub. A separate barbecue area with adjacent carport will give you plenty of space to host your guests, and there’s also a high-roof carport perfect for the family car, the caravan, or perhaps the horse truck. The fertile & alluvial 5.48 acres (2.22Ha) is divided into two paddocks and would be ideal for horse lovers, those wanting to raise their kids in a rural setting, or a hobby farmer wanting to lead a self-sufficient lifestyle. Our vendors have run about 9 sheep & 9 weaner steers through the spring/summer months, and there’s plenty of room to potter if you’re a gardening enthusiast. The feathered friends are catered for with a chook pen already in place. Town water is connected to the home and to stock troughs in the two paddocks. The school bus picks up at the front gate to take the kiddo’s to Ulmarra Infants/Primary school, and to High Schools in the Grafton area. There’s also a weekly garbage service and regular mail delivery. 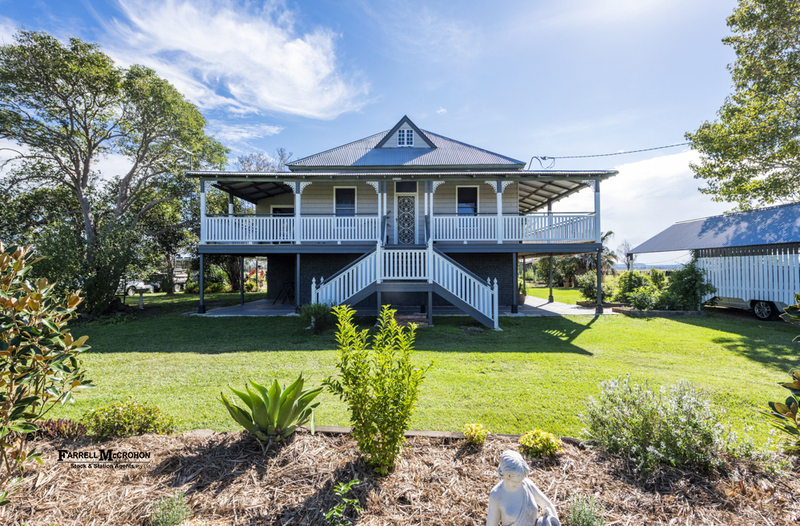 This beautiful property is situated about 20 minutes to the East of Grafton, positioned within easy driving distance to a number of beautiful beaches. A 5km drive in either direction will have you at either Ulmarra or Tucabia, both of which have their own general stores & sporting fields. Ulmarra is known for its historic buildings, antique & hand-made gift shops, art gallery, federtation-style Cafe & Hotel, and of course the ferry which crosses the mighty Clarence River. This property sure is something special and is bound to capture the interest from a vast range of buyers. Inspections are by appointment only; please phone JoJo Newby of Farrell McCrohon Stock & Station Agents to chat further.